DEF schadenfreude \SHOD-n-froy-duh\, noun: a malicious satisfaction obtained from the misfortunes of others. 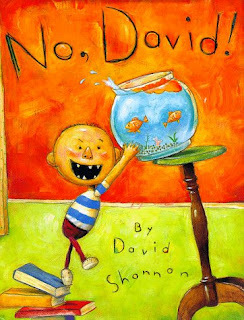 My kids love a book called "No, David". It is the first choice for reading of both my toddler and preschooler. I first saw this book in a bookstore, and thought that the depictions of this rascly little boy and the trouble he gets in to portrayed a negative message to kids. On every page, David is doing something naughty and being chastised by his mother. I thought, what a negative book, and put in back on the shelf. A couple months later, my kids were given this book as a gift, and despite my best efforts, it quickly became their favorite. They laugh with glee at each page. They ask to read it over and over. They exult in joining me saying, "No, David". They seem to think David and his troubles make for funny, funny stuff. The more I thought about this unfortunate human quirk, I realized that this played a big part in the value of this blog. It's embarrassing to admit, but I know that I often feel a huge sense of relief when I see another mom struggling. Another kid's public meltdown? Inside, I'm thinking "thank God it's not just mine". I tend to enjoy reading about other moms who don't have it all together. So I hope that by being vulnerable about our struggles here, you feel a little more normal. It makes me feel like we are all in this together, struggling alongside each other.